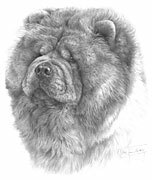 I approached the drawing of this Chow Chow with rather more than just trepidation! Where to begin? How to divide it up into manageable sections? It contains virtually no hard edges at all. Eventually I began with the right eye and worked outwards and, once I'd got a feel for the hair texture, it went surprisingly well. The drawing took approximately 110 hours to complete.